SnifProbe is based on the use of 15 mm short pieces of standard 0.53 mm I.D. 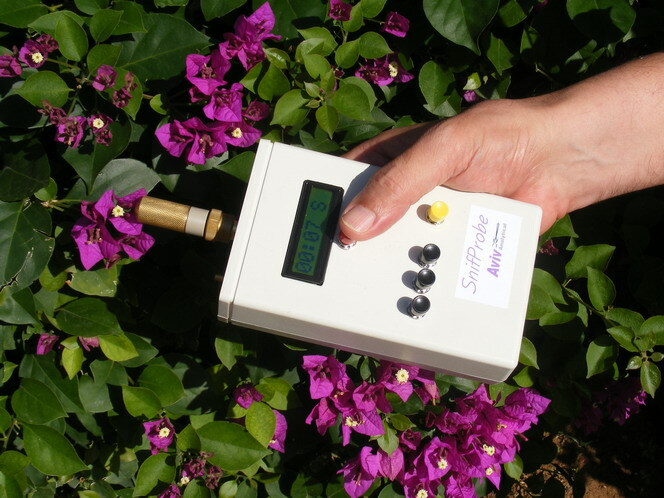 capillary or PLOT column for sampling air born, head-space, aroma or air pollution samples. A silicon tubing placed in a vial can also be employed for increased sample capacity (MicroSPE) and similarly microvials packed with activated carbon can serve for gas and volatile compounds analysis. SnifProbe sampling begins with the insertion of the short (15 mm) column into the SnifProbe easy-insertion-port and the SnifProbe is located or aimed at the sample environment. A miniature pump is operated for pumping ~40 ml/min of air sample through the sample collection short piece of column. After several seconds or a few minutes of pumping, the short column with the sample adsorbed in it is removed from the SnifProbe head with a tweezers and placed inside a ChromatoProbe glass vial having a 0.5 mm hole at its bottom. The ChromatoProbe sample holder with its glass vial and sample in the short column are introduced into the GC injector for intra GC injector sample thermal desorption. The sample is then quickly and efficiently vaporized from the short sample column and is transferred to the analytical column for conventional GC and/or GC-MS analysis. Alternatively, the sample traps can be stored in the fields in specially provided sealed storages unions for their shipment to the laboratory for their analysis. ChromatoProbe sample introduction devices are available from Varian (now Bruker) for its 1079 injector, from Agilent (named TSP), from FLIR (named PSI Probe) and from Aviv Analytical for the Varian/Bruker 1177 injector and for the Agilent 6890/7890 GC with its standard split splitless or MMI injectors. SnifProbe requires the ChromatoProbe but it works well with standard Split Splitless injectors and does not require a PTV injector. SnifProbe brings the field and process to the laboratory. SnifProbe can be operated in the field or at the process. The sample columns can be plugged in a sealed unions (provided by Aviv Analytical with the SnifProbe kit), placed in a small plastic bag, marked and brought to the laboratory for analysis with the full power of GC/GC-MS.
Thermally labile and semivolatile compounds such as explosives and CWA can be collected since the trapping column is easier to desorb than Tenax tubes. Compact. SnifProbe has small size and its miniature sample containers are easy to transport. Fast sampling. Large sample volume is quickly probed. Unlike SPME, SnifProbe is based on kinetic sampling that does not require lengthy equilibrium. Uniform response. The narrow column diameter ensures that all molecules are adsorbed. If the sampling time is limited, all the sample compounds are retained. Built-in external protection. Since the adsorption layer is internal and the trapping column is narrow, the sampling column can be introduced into difficult locations without touching the matrix. The sniffing column can also be fully covered except its opening. High sensitivity. Since SnifProbe is based on air pumping, large sample volume can be probed for increased sensitivity, particularly with high capacity silicon rubber or activated carbon packed micro vial sample traps (Micro-SPE). A broad range of sample column adsorption films/materials is available for sample collection optimization. From thin PDMS to thick PLOT/packed column materials or silicon rubber tubes. The Aviv Analytical SnifProbe kit includes five types of sample columns (including Micro-SPE), six columns each type for the total of 30 sample columns. Cost effective. SnifProbe is coming with the full power of ChromatoProbe of extract free dirty sample introduction capability and its additional use as an MS probe. SnifProbe enables most of the manual SPME, air bags, air canisters, SBSE ("Stir bar sorptive air extraction”) and Tenax tube applications with a few advantages, and is ideal for out of the laboratory or process sample collection, head-space and air born sample analysis. We have demonstrated the effectiveness of SnifProbe in several applications including the analysis of BTX in air, perfume on hand, beer head space, wine aroma, coffee aroma, trace chemical warfare agent simulants, explosives vapor, SO2 in air and ethanol in human breath. Please ask us to get pdf files of SnifProbe papers. The Aviv Analytical SnifProbe is available for delivery (In Stock) as a kit with all its essential consumables (including five each of six types of sample traps), ready for use.